doctrine, I knew it was right. I didn’t need detailed explanation or convincing. Venerating Mary? Of course. Infant Baptism? You bet! Confession? Finally! The true Body and Blood of Christ? Yes, please! Through the Grace of God, I was ready to embrace orthodoxy. The apologetics would come later. And so they have. I continue learning about the teachings of the church and I’m not surprised when something I read causes me to nod in agreement. “Yes, I knew that was right. Now I know why!” This was the case recently when I learned that the meaning of the word “liturgy” is actually “the work of the people”. I’ve known since the beginning that attending a Divine Liturgy was more than just wholesome entertainment and an inspiring sermon. I’ve known that Christ’s resurrection is celebrated by heaven and earth each time a Divine Liturgy is held. And I know that it’s hard to be a spectator at such a service. Even visitors are swept into the real-ness of the worship. This is because we, as Orthodox Christians, come to church to participate. We actively worship God through singing the responses, the psalms, the creed and the Lord’s Prayer. We make the sign of the cross, we bow, we venerate. We confess our sins, forgive one another, pray and light candles for our loved ones. And the work isn’t designated for a select few. 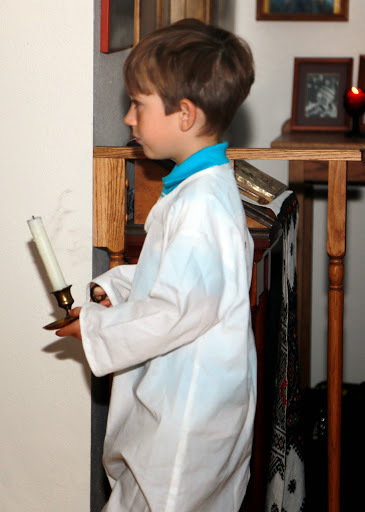 Everyone is called upon to engage in the worship, even the children. Allowing them to serve as taper-bearers and altar boys teaches that they are indeed full-fledged Christians who are needed by the church to serve and participate. So, yes, I guess it is work. It’s our job to partake with our brothers and sisters and all the saints in worshipping God. Then the reward comes when we receive the body and blood of Christ. We are clean and armed to go back into the world. As we greet one another after the service, it’s as if we’ve survived summer camp together, or completed an intense group project. We have been toiling together and it has been good. We are bound by the work and worship. And it is good.